Who is spending the most on weapons? Military spending in Eastern Europe went up 7.5% – the biggest increase of any region. Global military spending has increased in real terms for the first time since the US began withdrawing troops from Iraq and Afghanistan. Data from the Stockholm International Peace Research Institute shows a 1% real increase in global spending last year - the first increase since 2011. Which regions have increased military spending? The report shows that most regions of the world have cut their military expenditure, with Africa having the biggest drop at more than 5%. North America and Latin America and the Caribbean reduced spending by around 2%. Spending in Western and Central Europe was down 0.2% and has now fallen 8.5% since 2006. But expenditure in the Eastern European region (which includes Russia) went up 7.5% – the biggest increase of any region. Growth in military spending was most apparent in the countries bordering Russia and Ukraine, which the report says reflects “the escalating fear of a threat from Russia”. Asia and Oceania also boosted spending by just over 5%. Defence budgets have seen big cuts since the financial crash, with some of the world’s biggest spenders scaling back their military expenditure, including the UK, France and Germany. However, the report’s author, Sam Perlo-Freeman, notes that following recent terrorist attacks in Paris and Brussels, he expects to see “small increases” in Western European military budgets in 2016. The United States, despite a drop in 2015, is still the biggest global spender on its military, with a 2015 expenditure of almost $600 billion. This is considerably higher than the next biggest spender, China, which spent an estimated $215 billion on military. When measuring military expenditure as a share of GDP, Saudi Arabia tops the list with 13.7% of its GDP. By comparison, the US spends only 3.3% of its GDP on the military, and China an estimated 1.9%. 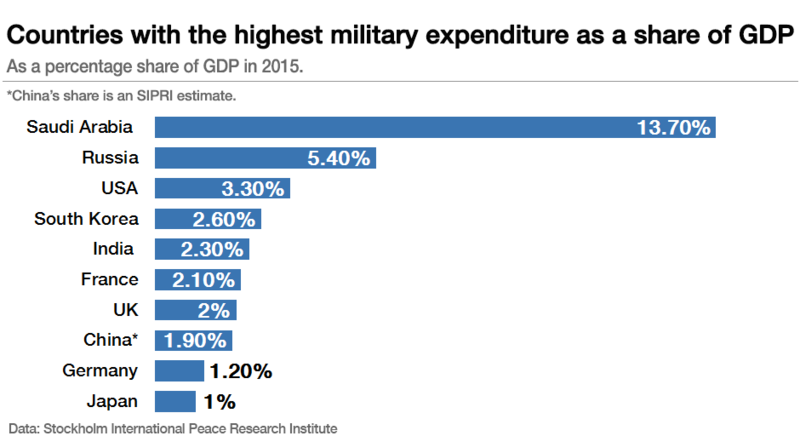 How much does China spend on its military? What will militaries of the future look like?